The apple trees Mauri Ditzler helped plant 30 years ago at his parents’ orchard in Parke County are developed and producing fully, which may be symbolic of Ditzler’s life. 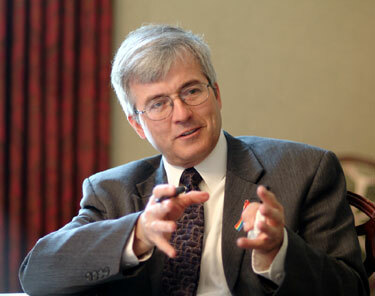 The Dean of Wabash College since 1999 feels the same way about his career choices and family. Dean Ditzler has followed the same steps as many members of the faculty and administration at Wabash. He graduated from the college in 1975 and figured, except for the memories, that may be his last contact. Ditzler attended Duke University and obtained a Ph.D. in analytical chemistry in 1979. "When I finished graduate school, I thought about the possibility of coming back to teach at (Wabash). I didn’t think about it too seriously because, first, I was thinking about going to a larger institution. But there was also only room for one analytical chemist on the staff here. Professor John Zimmerman, who was my professor, was in the middle of his career. It seemed like it would be a long wait." The initial ambition of teaching at a larger research university did not pan out. "Blame" it on Wabash. Ditzler took a teaching position at the College of Holy Cross, a liberal arts school in Massachusetts. "It was not the kind of position I was considering. But I agreed to go and talk to them, Ditzler admitted. "When I got on campus, it reminded me of my Wabash experiences." He spent the next 15 years there. "I imagined I would spend my entire career teaching chemistry. But somewhere along the line, I began to get involved in looking at college life curricula, than just chemistry curricula. From that, I started thinking about how college curriculum should be organized." The Rosedale High School graduate was drawn closer to home by his first dean’s position. He took a post at Millikin University at Decatur, Ill. in 1994. Five years later, Ditzler was back home. "Parke County always seemed like home," Ditzler said. "The opportunity to move back to west central Indiana was an opportunity I couldn’t pass up. The combination of the love for Wabash and, particularly, the love for Hoosier culture, just appealed to me." Although Ditzler and his wife, Judi, live in a house across from the campus, one of his loves is a pre-Civil War farm they own in Parke County adjacent to the one where he grew up. Judi manages the farm where they grow strawberries, raspberries and pumpkins. The Ditzlers also have planted sweet cherries and blueberries. "I spend my hobby time repairing the old barn built back when barns were put together with pegs. I’ve spent the last two years putting a roof on that barn." More of his hobby time is spent in the corn fields. Ditzler spends several weeks during July each year with a business he began 33 years ago. The business specializes in corn detasseling, including supervising high school aged workers in corn fields in Illinois and Indiana. Born at Warren, Ind., where his family had a dairy business, Ditzler lived at Nappanee from age 5 until junior high school. The family then moved to southwest Parke County. He was the first Rosedale student who ever attended Wabash. In fact, his recollection from the high school guidance counselor is that the recruiter from Wabash who came to his school was the first from any college. Ditzler thought he was just attending a school close to home. "The entire four years were life-defining. The thing Wabash did and does best is it gives young men confidence they can accomplish anything if they try." Overseeing the construction of Hays Hall, the new biology and chemistry building, was extremely satisfying. "I had participated in the planning of three new science buildings, one at each of the institutions I worked. This was the only one where I was still here when the building opened." The student achievements make it more exciting for Ditzler. "It has lived up to and exceeded our expectations. We were looking for a building that would support a community of young scientists. It’s doing remarkably well. The Ditzlers have raised their own team of scientists. Daughter, Meggan, lives in Vermont and is also a chemistry teacher. She currently is taking time off to raise her infant son, Sam. Mark is in the biophysics graduation program at the University of Michigan. He has a daughter, Amelia, also less than a year old. Lorin, the youngest, is a junior at Grinnell College in Iowa. The grandchildren met for the first time at Christmas. Ditzler’s parents still live in Parke County and continue to sell apples off the trees he planted during his spring breaks attending Wabash. Now he is back and, to no surprise, does not plan to leave. "I’m remarkably happy at Wabash. It’s a good match and I’d be delighted being here for the rest of my career." Rob Lee is a reporter for The Paper of Montgomery County. This story was published Jan. 10, 2004.